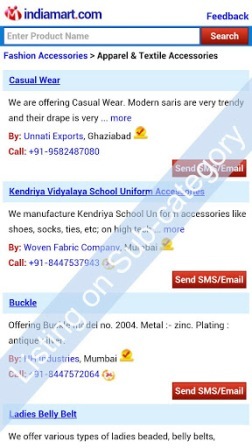 In an initiative to expand its user engagement, Indiamart.com, an online business to business (B2B) marketplace, has introduced their mobile site — m.indiamart.com and Android App on Google Play Store. By using the website and Android app, prospective buyers can now find suppliers in specific locations or cities. It also allows them to send business enquiries and SMS directly from their mobile phones. Buyers can even call suppliers directly by clicking on their displayed number. I gave the app a spin and found it fast and it gave out results quick even on a normal 2G speed. 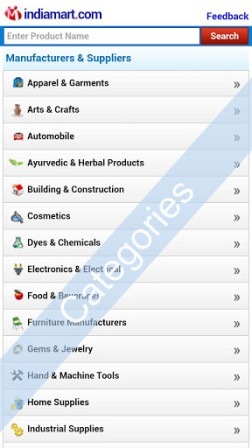 The app has a simple and clean user interface and does not feel cluttered even with a large number of categories. 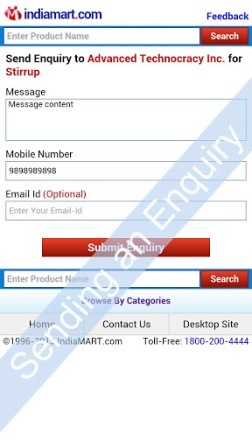 Indiamart App operates on all mobile devices having Android Version 1.5 or above installed. The company claims that it connects users to 1.2 million suppliers and 6.5 million buyers on its platform. The online information & E-commerce portal recently launched a new Search feature that helps finding suppliers relevant to the location of operations. Currently there are few good B2B marketplaces in India like Amazon, eBay and latest addition getitBazaar. Such marketplaces are a boon for startups and SMEs. More such dedicated platforms should be launched to expand the ecommerce ecosystem. Meanwhile, the move by IndiaMart is thoughtful considering the rampant use of mobiles. We might see such other marketplaces take a que from this and introduce their own app.